Located just minutes from historic New Hope and Doylestown, PA as well as Lambertville, NJ, in beautiful Bucks County, Peddler’s Village is a charming resort destination featuring 65 specialty shops, five restaurants, the luxurious Golden Plough Inn, and Giggleberry Fair, an indoor family entertainment center. Spread over 42 acres of lushly landscaped gardens and winding red brick pedestrian pathways, Peddler’s Village is one of the most-visited attractions in Pennsylvania. You could spend days exploring the fashion and accessory boutiques, art galleries, gourmet foods stores, gift shops and home furnishings stores. On weekends throughout the year, festivals and special events showcase the splendor of the season – whether it’s strawberries, scarecrows or Santa Claus. Peddler’s Village is located just 45 minutes from downtown Philadelphia and an hour-and-a-half from New York City. With 65 shops, five restaurants and two million visitors annually, Peddlers Village is an everything-but-ordinary-location for your next recreational or business venture. Dozens of festivals fill the Peddler’s Village calendar, making it the #1 spot in Bucks County to relax, unwind and be captivated by the splendor of the changing seasons. From apple festivals and holiday lights to scarecrow-making workshops and pie-eating contests, there’s always something magical happening along the red brick pathways of Peddler’s Village. There’s always something fun for families to do at Peddler’s Village. Full days can be spent exploring 10,000-square-foot Giggleberry Fair and its three-story, six-level Giggleberry Mountain obstacle course; Giggles Discovers! (tailor-made for toddlers and preschoolers); and the Grand Carousel, the exquisite antique carousel featuring 46 exquisitely carved horses, rabbits, giraffes – even a spotted hog. For more information, please visit the Peddler’s Village site. With 65 unique shops and boutiques to explore, 42-acre Peddler’s Village is a shopper’s paradise. Nearby, the antiques shops, art galleries, wineries and gourmet food shops of historic New Hope promise hours of delightful browsing. Bucks County farmers’ markets offer fresh organic foods, Amish meats and even a few pick-your-own options, while its popular flea markets are a treasure trove of one-of-a-kind finds. The Bucks County countryside is waiting to be explored. From leaf peeping excursions to winter wanderings, covered bridges to artists’ enclaves, the breathtaking beauty of Bucks County awaits around every corner. The Splendor of Fall Foliage – When summer fades and days become cooler, leaf-peeping season is officially here. You’ll know it by the brilliant shades of deep gold, vibrant red and burnt orange all around you. Whether you see it by car, bicycle, train or hot air balloon, the rich, warm beauty of Bucks County is something you’ll never forget. Explore all the ways to experience fall foliage season here. Picture This – The architecture, history and landscapes of Bucks County have delighted artists for decades. There are lots of backdrops for painting and photography. A few of our favorites include Peace Valley Park, the Bucks County Playhouse, the James A Michener Museum, Moravian Pottery & Tile Works and Mercer Mile which showcases Henry Mercer’s magnificent concrete castles. There are hundreds of idyllic settings for artists in residence. For inspiration, click here. Covered Bridges – A dozen picturesque covered bridges dot Bucks County’s back roads and create a beautiful backdrop for photography. Ranging in length from 56 to 150 feet, these authentic 19th century bridges invite visitors to step back in time. For a Covered Bridge Driving Tour, click here. Wonderful Winters – Snow days are some of the best days in Bucks County. After all, what could be more beautiful than a blanket of snow covering the countryside? Whether you spend the day skiing, snowshoeing, ice skating on a frozen lake or warming up with coffee in a Bucks County coffee bar, winter is one of our most beautiful seasons. Explore all the wintertime wonders of the countryside here. 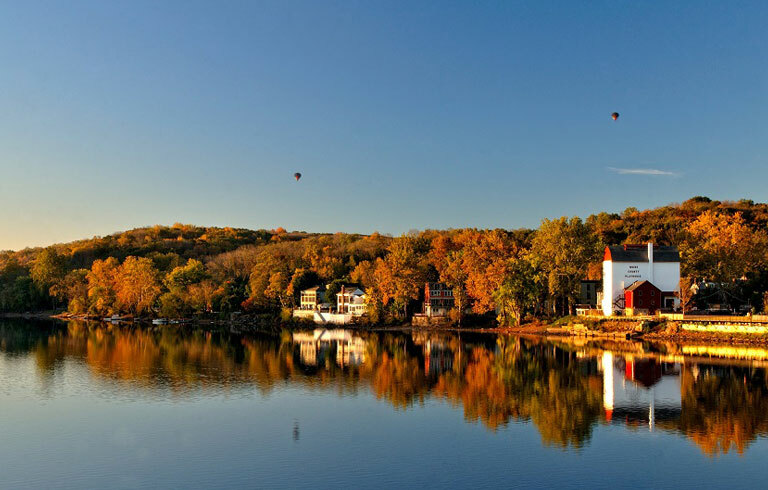 Hot Air Balloon Rides – Available year round from Peddler’s Village. Experience one of the most beautiful countrysides in America from the unexplored heights! Please call 215-794-4005 for more information or to make reservations. Discounted rates available for guests of the inn.